I’m currently writing the materials for my presentation on Core Data & Synchronization of data for RWDevCon 2016. One of the requirements for the demonstration app is a web service that provides a REST API to sync with. One of the requirements of the talk is that I cannot rely upon an Internet connection. Every person going through the tutorial needs to be able to bring up a local web service to following along with while coding the iOS app on their machine. I started looking into a lot of wrappers for web apps, including Electron. The issue is I have a limited amount of time to come up with a solution that is super simple for conference attendees to install and bring up. I haven’t developed a web app for a couple years – and I feel so rusty. I do not have a trusty fallback programming language outside of Swift and Objective-C. I really feel stupid sometimes not knowing Ruby, Python or any other language as well as I feel like I should. I ended up digging for two full nights and got super frustrated. There is just so much to learn about a new language, their web frameworks, persistence layers, and on and on. I still need to find time to write the iOS demo application – so I ended up time-boxing the search. Suddenly I had a moment of clarity. I remembered CouchDB – a document store/database that has a JSON REST API built in! I first learned about the Apache CouchDB project from a presentation given by Jens Alfke at SecondConf in Chicago, 2011. Here’s a super interesting write up on how to implement a natural language search using Core Data in a Mac or iOS app. Black Pixel needed to find a way to bring a more natural way for users of the Inspirato app to search for the right vacation. Pretty cool stuff here and something I was very excited to read about with my previous experience with search technologies. It is very surreal to see your name on a printed book. I thought I knew a lot about Core Data with having used it a lot over the past years. Today, I learned something new that I feel like I should have known for a long time. NSManagedObjectIDs can change. Seriously. If you want a different notion of identity, you can just add an UUID string as an attribute to your entity. A separate mapping table is not recommend. The 2 apps should agree to use the same UUIDs for the same identities. Ben is one of the core developers of Core Data at Apple. The last sentence describing ways primary keys can change blew my mind when mentioning “not-light-weight migration”. In WordPress for iOS we sometimes have to perform heavyweight migrations – especially in the case of removing objects or combining object ancestries. In a number of cases we use NSManagedObjectID’s URIRepresentation and throw it in NSUserDefaults for retrieval later. Turns out, that ID isn’t stable enough between migrations. The solution, as Ben points out, is to create a UUID and make the ID yourself upon initial persistence. Glue is the thing that … well … glues everything together. You don’t see glue (if the product is made right) but it plays an important role in the overall satisfaction with the product. If you buy a bird house that has bad gluing technique or not enough glue, you will be upset when the first bird flattens the house. The same hold trues for mobile apps as well as web and desktop applications. For sake of this discussion, I’m limiting myself to mobile apps and mentioning some specific iOS technologies. It’s easy to get hung up on the visual details and leave some of these incredibly important things to the side. Users may not see the problems outright but they will come to associate a bad feel with your app if things don’t work quite right. I’ve been an avid Fuelband user for almost two years now. I’ve come to treat the device as something that I use every day and pay attention to how much activity I’ve done for the day. Getting to green is my goal and it irritates me when things don’t work. Some of the glue that has been broken lately includes funky sync over Bluetooth LE and bad dates/times when syncing with their web app. The web app itself has also been flaky and slow. This is a good example of when a beautifully designed app fails the user and causes distrust of the entire brand. A balance has to be maintained between visual and the non-visual elements of an application. If you’re in charge of running a mobile project, make sure the people paying the bill know upfront what’s important to keep in mind when developing an application. If they don’t want to pay for what you’re estimating, don’t take the project. This may be a little hard at an ad agency or working with an internal department, but the outcome is the same. Make sure they know if all they want to focus on is the user experience and visual design, the output will be of prototype quality. It’s your job to educate your customer and product owner of the importance of the things that can’t be seen. 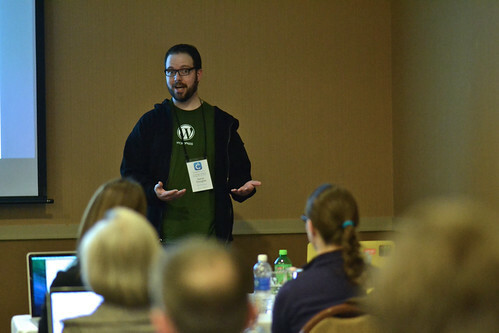 I was lucky enough to be able to speak at CocoaConf Chicago 2014 about some more advanced Core Data topics. The bulk of the talk surrounded concurrency and data model migrations but I did touch on a number of other things. Sadly the session wasn’t recorded, but I am considering recording a screencast if there is enough interest.